Loop stitch — I’ve been cooking up a reason to try this one out. There’s a good video tutorial at Martha Stewart. Speaking of which, did you see the big knitting feature in the Jan issue? I’m eager to see them start fleshing this out. This entry was posted in Finds and tagged knitting, new favorites, stitch patterns. Bookmark the permalink. Super cool, Karen! LOVE it! I think I’m more into it for the home than the wardrobe, but who knows! Hadn’t thought to look on Ravelry for that. Now I do like the idea of knitted furniture slipcovers….sending you my ottoman dimensions. Pretty sure Meg already faved a pattern for that. oh my gosh karen i LOVE this! A snuggly lamby thing. Thank GOD i have you to find all these great things. 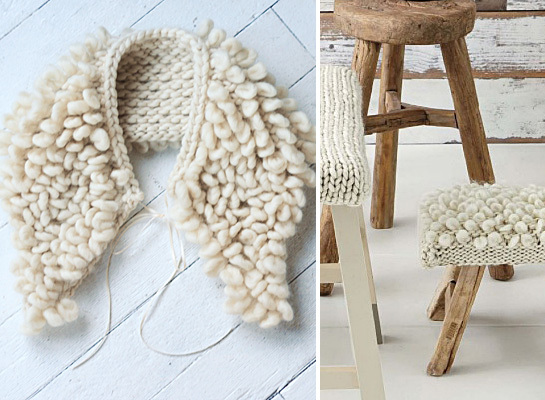 do you think it’s doable for a sloppy knitter like me??? I don’t know; I’ve never actually tried it myself. We should try it together one of these days. ok! you got a deal!